A Interim Group Management Report 5 Executive Summary 12 Property-Casualty Insurance Operations 22 Life/Health Insurance Operations 28 Asset Management 32 Corporate and Other 35 Outlook 37 Balance Sheet Review 44 Reconciliations Interim Report Third Quarter and First Nine Months of 2014 Allianz Group 29 On 26 September 2014 the Chief Investment Officer of PIMCOresigned. Immediately after his resignation an orderly succession process was executed and led to the appointment of new investment manage- ment leadership at PIMCO. As of 30 September 2014, total assets under management amounted to € 1,872 BN. Of this, € 1,411 BN related to our third-party assets under management and € 461 BN to ­Allianz group assets. In the first nine months of 2014, we recorded net outflows of total assets under management of € 79 BN. Net outflows from third-party assets under management of € 84 BN were strongly driven by PIMCO in the United States. In the third quarter, PIMCO experienced third- party net outflows particularly at the end of September in conjunc- tion with the market’s reaction to the departure of PIMCO’s Chief Investment Officer. 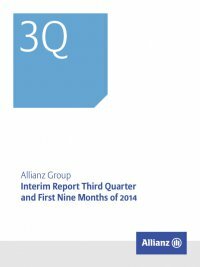 ­AllianzGI recorded net inflows for the seventh consecutive quarter. Market effects contributed € 100 BN to total assets under man- agement, with € 77 BN at PIMCO and € 22 BN at ­AllianzGI. As of 1 January 2014, the ­Allianz group allocated certain entities to other business segments which resulted in a decrease of € 34 BN in assets under management. This was partially compensated by a change in reporting to include third-party fund of fund assets under management in our total assets under management. These effects were the main drivers for a decline in total assets under management of€ 23 BN,reportedasconsolidation,deconsolidationandothereffects. We recorded favorable foreign currency translation effects of € 105 BN, in particular on the fixed income assets, mainly as a result of the appreciation of the U.S. Dollar.1 1 Based on the closing rates on the respective balance sheet dates. In the following section, we focus on the development of third-party assets under management. As of 30 September 2014, the share of third-party assets under management by business unit was 82.4 % attributable to PIMCO and 17.6 % to ­AllianzGI. Third-party assets under management by region/country1 as of 30 September 2014 [31 December 2013] in % Other2 0.0 [2.3] Europe 27.7 [26.4]America3 62.2 [61.5] Asia-Pacific 10.1 [9.8] 1 Based on the location of the asset management company. 2 “Other” consists of third-party assets managed by other ­Allianz Group companies which were allocated to other business segments as of 1 January 2014. 3 “America” consists of the United States, Canada and Brazil (approximately € 862 BN, € 15 BN and € 1 BN third-party assets under management as of 30 September 2014, respectively). The regional allocation of third-party assets under management shifted slightly due to the allocation of certain entities to other busi- ness segments, due to the change in reporting of fund of fund assets, positive market effects and foreign currency translation effects. The relative share of our third-party assets under management increased by one percentage point in equities. This was mainly driven by the impact of market return, positive foreign currency translation effects and the change in reporting to include third-party fund of fund assets under management in our total assets under manage- ment. As of 30 September 2014, 86 % of third-party assets under man- agement were attributable to fixed income and 14 % to equities. The share of third-party assets under management between our retail and institutional clients2 changed slightly – down one percent- age point for retail clients (36 %) and up one percentage point for institutional clients (64 %). 2 Client group classification is driven by investment vehicle types.